ACCF has been around for more than 40 years — we think it’s the first time we’ve ever been accused of advancing subconscious messaging! But hyperbole aside, the problem with CalPERS isn’t that too many folks misunderstand its strategies and operations. It’s that too few understand the depth and severity of the situation it finds itself in right now – or the ways in which CalPERS deliberately acts to mask the full implications of that status to taxpayers and fund beneficiaries. CalPERS can mask the truth – but it can’t hide it completely. You just have to know where to find it. The CalPERS annual report is a good place to start. It’s a glossy document – really nice design quality to it, but written in a way that is intentionally opaque. Brave souls who were able to get through the whole report were rewarded on pages 129 and 130 with the revelation that, for the first time in at least a decade (and possibly ever), CalPERS has failed its own solvency test. What’s that supposed to mean? Well, it means the present value of the fund does not cover all the payouts scheduled for current retirees. And if they can’t cover current retirees, how are they supposed to cover future ones? They can’t. And believe it or not, it’s probably even worse than they’re describing given that hyper-inflated discount rate they use to run the solvency analysis. The unfunded liabilities grew year-over-year to an astounding $138 billion. Compare this to ten years ago, when CalPERS was overfunded by $3 billion. If the funding ratio is expected to go down in a year in which the pension returned 11.2%, how can CalPERS realistically expect to increase the funding status moving forward, especially considering benefit payouts continue to grow – last year 3% to $21.4 billion? What level of return is required to increase the funding status on annual basis? 11.5%? 12.0%? Despite the increase in taxes municipalities had to pay as a result of CalPERS’s poor performance, the fund exacerbated this issue by decreasing its investments in California-based companies & projects by over $2 billion in the year to $24.7 billion. In FY2015, CalPERS had invested over $30 billion in its home state. As these domestic investments fell off, foreign investment (including the initiation of a position in Qatar and holding substantial positions in high emitting countries like China, India and Russia) increased over $10 billion. CalPERS criticizes ACCF’s analysis for focusing on how the fund performed when it came to ESG investing. Reacting to the fact that four of CalPERS’s nine worst performing funds were ESG-focused, CalPERS notes that those funds accounted for only $600 million, a relatively small percentage of the overall asset base. And that’s true: $600 million isn’t a massive amount of money for a fund the size of CalPERS, but it is enough to pay annual benefits for 12,000 retirees at $50,000 each for one year, or 600 retirees over 20 years. Six-hundred million dollars may not be real money to CalPERS, but it is to lots of CalPERS beneficiaries. They’re right: lowering the discount rate to a level more in line with the reality that exists on Planet Earth would do serious damage. But keeping it where it’s at doesn’t solve any problems either – it just kicks them down the road. CalPERS can’t gimmick its way out of the mess it finds itself in today – smoke and mirrors only takes you so far. CalPERS may disagree with our report. 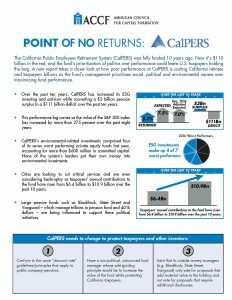 But one fact cannot be disputed: “CalPERS, a $345 billion pension fund, has enough assets to pay about two-thirds of the money it owes to California public workers and retirees” and its own 2017 report implies CalPERS has no money available for future retirees. Regardless of how you view the fund’s investment decisions, this is an alarming reality for all beneficiaries who rely on the fund and the taxpayers who are left to foot the bill if CalPERS can’t perform.